The Versa leads the small-car pack in spaciousness, which is worth considering if you carry passengers in the back seat. Standing tall in both dimensions and refinement, it may also tempt those who appreciate the smoothness of a CVT, which promises 33 miles per gallon on the highway (according to EPA fuel-economy estimates). Brakes work great and the tires hold up well. Very safe car. I have had my 2009 Nissan versa for about 4 months now and it's by far the most dependable car I have had. It drives real smooth and the inside has a lot of room which is one of my personal favorite features about this car due to spending a lot of time on the road. I had not had any problems with this car and it was not new off the lot. It's even decent on gas. The only thing wrong with my car is that is does not have air condition. That was caused by the previous owners who hit a deer. I am sure the ac works just fine if you get a versa that has the ac pump. However parts are sometimes expensive and not the quickest or easiest to replace. I would not recommend this car if you are on a strict budget. The radio is very nice. It gets good channels in a lot of areas. As well as the speakers everything sounds really clear unless you are playing something that has heavy bass or drum beats, the speakers do not sound the best when heavy bass or drums is played to loudly. All in all I give this car a 9/10 and I would recommend it to anyone wanting a nice little family car. 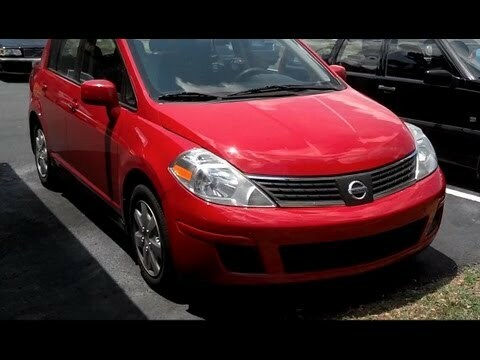 2008 Nissan versa grey - reliable and safe. The main problems with my vehicle are that the check engine light has been on for years and the low tire light is consistently on as well. I will say that the vehicle is a bit noisy when the air conditioning is running. Other than this, it has been a very reliable car and I would purchase another Nissan. There is a surprising amount of space in the back seat and the trunk. Overall it is a smooth ride. I feel it is a reliable and safe car. It has basic features but everything that I would find essential with a vehicle, including cruise control and electronic windows and locks. The Nissan Versa I own is a quality, reliable vehicle. My favorite part about it is the roominess that it offers, even though it is a compact car. People who sit in the back seat have more leg and head room than I have seen in any other small car. The hatchback makes it easy to transport heavy or bulky items for things like home improvement projects, furniture or camping trips. The only trouble I have come across is smaller pieces, such as the cover to the door handle, have come off, but that was after 10 years of continuous use. I love my Nissan Versa!